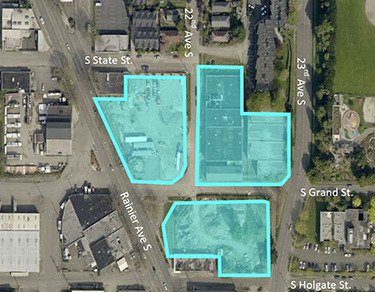 The site comprises 16 parcels arranged in three chunks at South Grand Street and Rainier Avenue South. About 3.2 acres in the Rainier Valley sold last Friday for almost $19.9 million, according to King County records. The sellers were four LLCs representing the Centioli family and others. Jason Rosauer and Rob Anderson of Kidder Mathews were their brokers. The buyer was Grand Street Commons LLC a new venture among Mt. Baker Housing Association, Lake Union Partners and HAL Real Estate. A press release accompanied the sale and provided details. 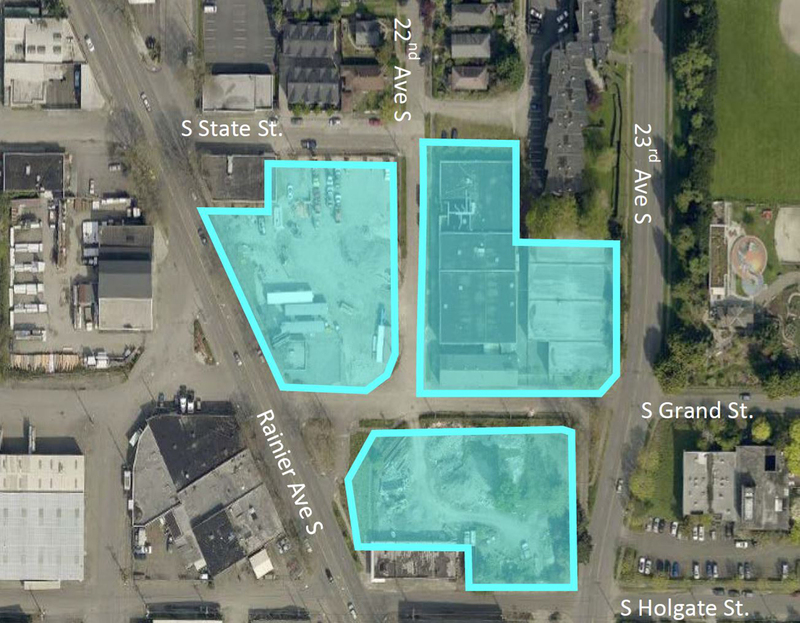 The site comprises 16 parcels arranged in three chunks at South Grand Street and Rainier Avenue South. There’s no official project address yet. The site a few blocks south of the Judkins Park Station, at Interstate 90, where light rail service will begin in 2023. It’s zoned up to 65 feet now, with an anticipated upzone to 75 feet under the Housing Affordability and Livability Agenda (HALA). The plan is for Mt. Baker Housing to develop about 150 units of family-oriented affordable housing. Lake Union Partners will develop about 550 units that are both market-rate and affordable. HAL Real Estate is their financial partner. About 65,000 square feet of commercial space is planned—with prospective tenants to include a grocery store, drug store, medical clinic and retail/commercial space for local entrepreneurs. Mt. Baker Housing’s Conor Hansen said in a statement, “This pioneering project leverages the strengths and resources of a non-profit affordable housing developer and a private workforce/market-rate/mixed-use developer alongside the resources of a public agency—all with a shared focus of building affordable housing.” Mt. Baker Housing’s units will be priced at 60 percent of AMI. Ecology has long been working on a cleanup plan for the site, which has been vacant for about a decade. Various portions of the property are contaminated from past uses by a dry cleaner and auto-related businesses. In a new program, approved by the legislature in 2013, state funds will be used in the cleanup of trichloroethene (TCE), tetrachloroethene (PCE), vinyl chloride and other chemicals. Before, the state’s Prospective Purchaser Consent Decree was only used for brownfield cleanup for cities, ports and other government entities. It was broadened to include affordable housing and other public benefits. The most polluted areas were not part of Friday’s sale. On those separate properties (aka Seattle Collision Center and Penthouse Drapery), Ecology is using electrical resistance heating wells (ERH) to remove chlorinated solvents from soil and groundwater. Ecology says that most of the 3.2 acres that sold were owned by Belshaw Brothers, Inc. from approximately 1924 until the early 2000s. That property was primarily used to manufacture bakery and restaurant equipment. Subsequent owners of the Belshaw property performed voluntary cleanup before selling. Aspect Consulting and Perkins Coie are also on the Grand Street Commons team. Both are also consulting on Mt. Baker Housing’s planned 144-unit, $55 million Maddux project, where $6.2 million in Ecology funds will remediate pollution from a dry cleaner and a gas station. That project, with two buildings at 2802 S. McClellan St. and 2800 Martin Luther King Jr. Way, is very close to Mount Baker Station. It’s about a mile south from Grand Street Commons. It’s also the first project to employ Ecology cleanup funds to support affordable housing. Grand Street Commons is the second. No architect or general contractor has been announced for Grand Street Commons. The developers hope to start construction in 2021 and be finished when Judkins Park Station opens in 2023.